Category 3: Invader plants may no longer be planted. Within the sphere of our bird garden most of the two hundred odd listed plants have no bearing, but there are a number of plants that frequently occur of which we have to be aware of. Most of these plants bear fruit that are attractive to birds and the plants are thus spread. Many of us will not even be aware that we have these plants as they have grown from seed without any interference from us. One of my biggest bugbears with the alien invader list is that nowhere you can find a list that includes pictures of the plants. Most of us will only be able to address these species in our gardens if we know what to look for. I will cover seven species that I have found to be the most common ones in our gardens, and will describe them in the order most likely to least likely to be found in your garden. Most of these plants are category 3, thus you are allowed to have it in your garden, but not propagate it. As they are all propagated via birds eating the fruit and seeds, this is a dilemma, as in my view, by keeping the plant you are in fact allowing it to multiply. 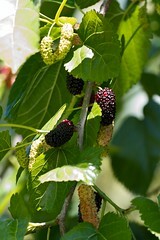 Who of us do not relish the taste of perfectly ripe mulberries in spring? Yet most parents will be glad to get rid of their mulberry trees, and in consequence also of a box full of silkworms. I have hardly ever found a garden without a mulberry tree. Most often the property owners are not even aware that they have one growing, or they willingly left it growing, they viewed it as a fruit tree. In my own garden I probably remove 10 to 20 saplings a year, and I deem it to be very invasive. 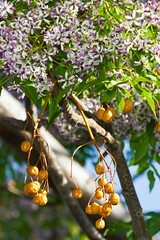 Although the tree draws a host of birds when it has fruit, I still cannot see it as an asset to the garden. The purple pulp mess around the tree is not attractive and neither are the purple poop stains on drying washing or house walls. The mulberry is scientifically notable for its rapid pollen movement. The flowers fire pollen into the air by rapidly releasing stored elastic energy in the stamens. The resulting movement is in excess of 560 km/h, making it the fastest known movement in the plant kingdom. Even this amazing feat cannot endear this tree to me, and my advice is: if you have one please remove it. I am often puzzled why this tree is only a category 3 plant as I have found this tree growing all over our countryside. To most of us living in the central and northern parts of the country the masses of lilac flowers in spring and the yellow hard berries that follow soon after is a common sight. The leaves are sometimes used as a natural insecticide to keep with stored food, but are somewhat risky as they are highly poisonous. Fruits are poisonous to humans if eaten in quantity. These toxins are not harmful to birds, who often gorge themselves on the fruit. There are a number of ligustrum species which have been listed as invaders, but the two most common ones found in our gardens are the Japanese wax – leaved privet (Ligustrum japonicum ) and Chinese wax – leaved privet (Ligustrum lucidum). Both have been planted as ornamental trees in gardens, especially for their purple berries that are borne en masse in clusters. Birds are very fond of these berries and they are a firm favorite of African Olive Pigeons. Many streets in Johannesburg were planted with these trees years ago. 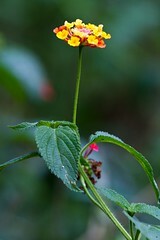 Lantana can be purchased at nurseries, but they are all none seed bearing. All other varieties are listed as a category 1 invader and should be destroyed as fast as possible if found in your garden! The most common variety found is Lantana camara which is often commonly referred to as “Ham ‘n Eggs” due to the adjacent pink and yellow inflorescences. The fruit is a delicacy for many birds who distribute the seeds. The spread of lantana is aided by the characteristic of their leaves, which are somewhat poisonous to most animals, and they are thus left unhindered to flower and seed. The plant contains pentacyclic triterpenoids that cause hepatotoxicity and photosensitivity when ingested by grazing animals which has lead to some livestock losses. Two species of cotoneaster is fairly common in our gardens and also frequently found along roadsides. Unfortunately they were planted in the past as hedges separating dual carriage ways. The two common species are Franchet’s Cotoneaster (Cotoneaster franchetii) and Silverleaf Cotoneaster (Cotoneaster pannosa). 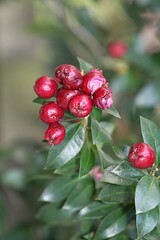 The shrubs produce masses of red berries in summer time which are eaten and distributed by birds. They do better in the colder parts of the country and are widely distributed in the Freestate, Northwest and Gauteng. This tree has a few common names including “plum rose” and “water apple” but I have also heard people refer to it as a “water berry” as it is related, and looks similar to our indigenous Water Berry (Syzigium cordatum). S. cordatum’s distribution is in the warmer regions of the eastern part of the country along rivers in the Lowveld and Northern KZN. S. Jambos grows well in colder areas and is widespread in most of the higher rainfall areas. The tree can become quite large and as it does not have invasive roots it was popular as a garden tree. The fruits are fleshy and red in colour when ripe and are produced in masses in December and January, often turning the ground below red as they drop down. Prickly pears have become one of the most extensive invaders in South Africa. Between the eight species that have been declared, they have just about managed to invade every habitat and biome in the country. I have observed them from Kruger to Hermanus, and as their red ripe fruit is a delicacy for birds, they spread easily. As they are used to dry conditions and poor soil, the seed germinates in just about every favourable condition. Fortunately they are steadily disappearing from our gardens as it is not a pretty plant, and most gardeners remove them as their thorns are highly irritating to skin. Bugweed, Tobacco Bush or Kerosene Bush is a small tree or shrub native to South America. The plant has a life of up to thirty years, and can grow up to 10m tall. 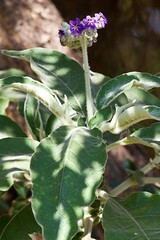 The leaves are dull green and velvety above, white felt-like beneath and emit a strong smell when bruised. The flower is purple with a yellow center. 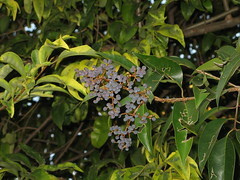 All parts of the Solanum mauritianum plant are poisonous to humans, especially the berries. In South Africa, biological control has been introduced to attempt to control the plant. S. mauritianum is a favoured food of the African Olive-pigeon. The berries are so attractive to birds that they stop feeding on the fruits of indigenous plants increasing the risk that some may become locally extinct in their distribution areas. I urge all of you to have a walk around your gardens and see which of these plants you do have, unless it is lantana and prickly pear, you don’t have to remove them immediately but please start planning on taking these out and replacing them with something indigenous that is just as attractive. The next drawcard is water..